Nestled in the Nervia Valley in the region of Liguria, is the charming town of Dolceacqua. 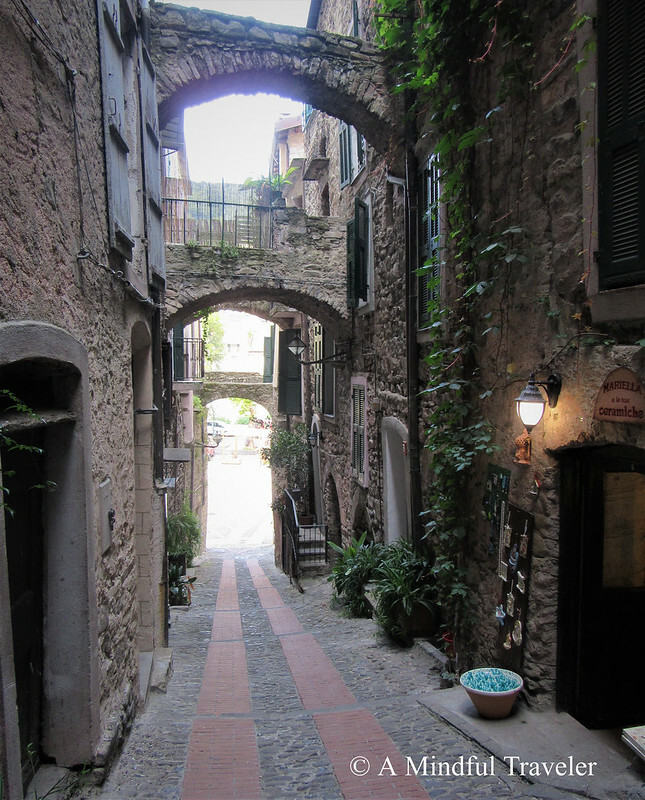 Dolceacqua is located 120km southwest of Genoa and is extremely close to the French border. The agricultural region is renowned for its fruitful olive groves and vineyards. 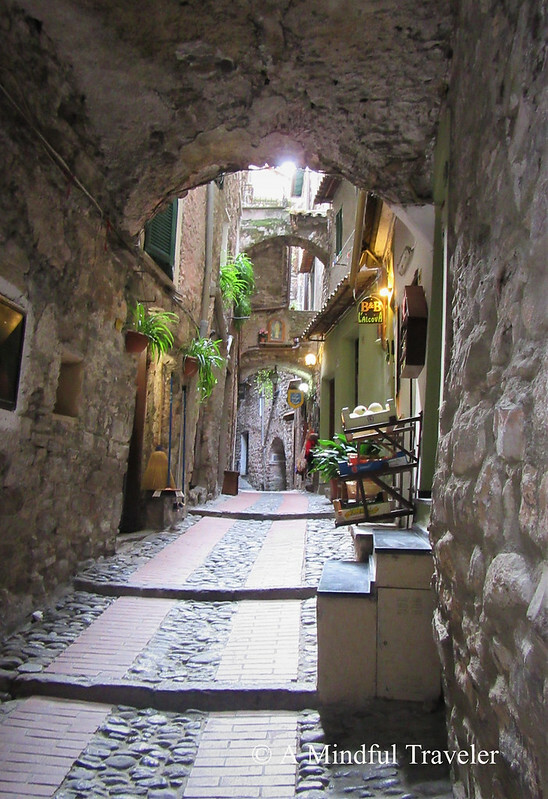 Dolceacqua is tucked away, from the hustle and bustle of the Italian Riviera. It delivers its own sense of calmness and beauty in comparison to its neighboring hectic seaside towns. 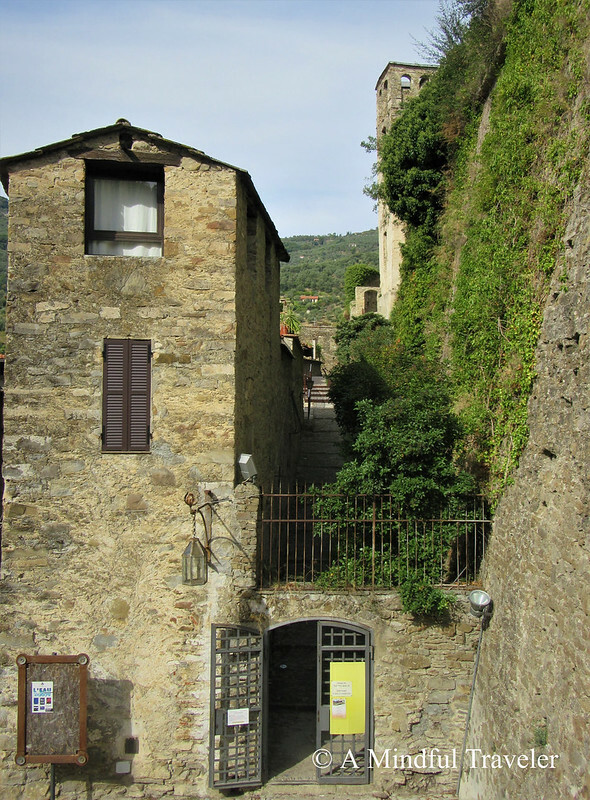 The town of Dolceacqua is split into two sections, old, “Terra” (land) and new, “Borgo” (village). 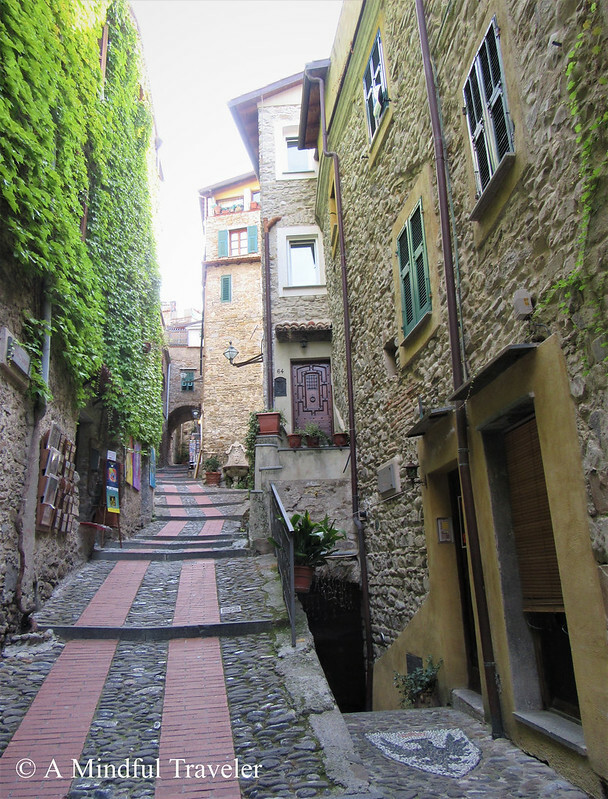 The old section of Terra is what captivates Dolceacqua’s visitors. Easily explored by foot, the old town will have you meandering through dark narrow alleyways lined with cobblestone paths. Explore the art galleries within private courtyards, where sunlight peeps through the fractured cracks of the walls. 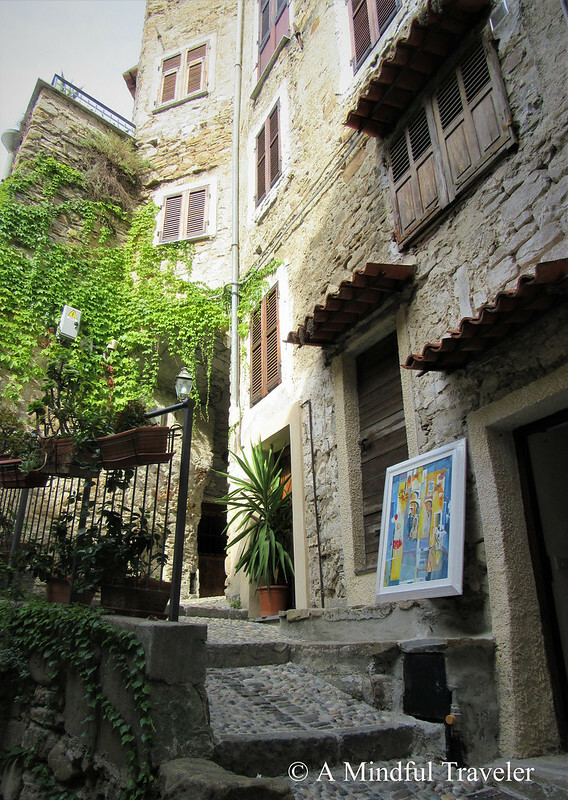 The cooler temperature inside the town’s facade emanates, as a result of stone houses and walls. The zig-zagged steep climb toward the top of Terra, is not a tiring one. Instead, it is a pleasant hike welcomed by Castello dei Doria. Adhered to the hilltop it sits upon, the historic castle from the 12th century is Dolceacqua’s centerpiece. At one of the entrances to the castle, La Fresque des Doria (The Doria Fresco), depicts life as it was in the castle in early time. These large stone images reveal rich history and tradition. Originally belonging to and named after the Doria family, the castle’s grand stature can be viewed from miles away. From the top towers, a sweeping panorama of the lush green surrounding hills of the Nervia Valley is inescapable. Alongside the castle, another feature of this alluring town is its medieval humped bridge. Built in the 15th century the pedestrian-only bridge, divides the old and the new parts of Dolceacqua and oversees the Nervia River. It’s no wonder famous French impressionist painter Claude Monet, captured the irrevocable beauty of this bridge and town. 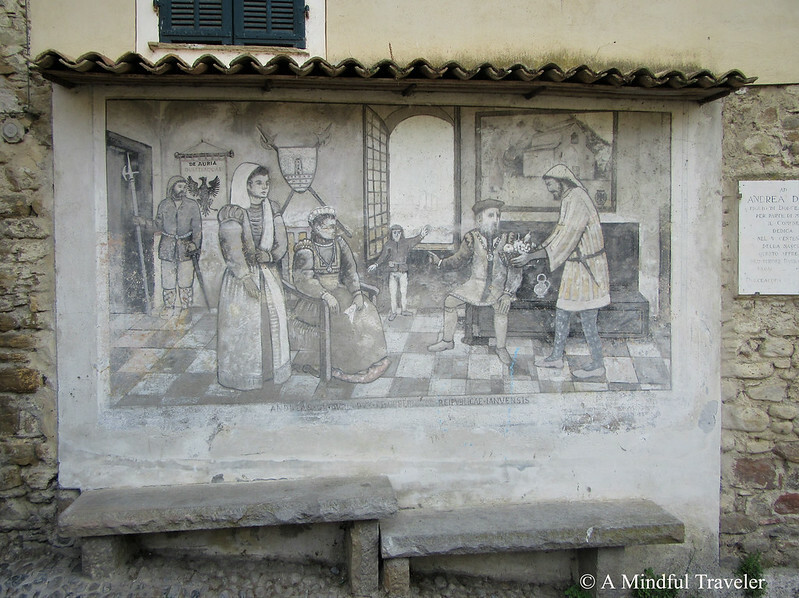 In 1884, inspiration from the commune of Bordighera, lead him to Dolceacqua, where he painted four works of art, incorporating the bridge and the castle, which remarkably resemble the untouched town as it still is today. Strolling through the stonework maze of this little gem is serene. Yes, you may reach a dead-end street or get lost within the intricacy of alleyways, but in the end, you just may stumble upon something sweet or surprising or a local, who simply would love to chat. 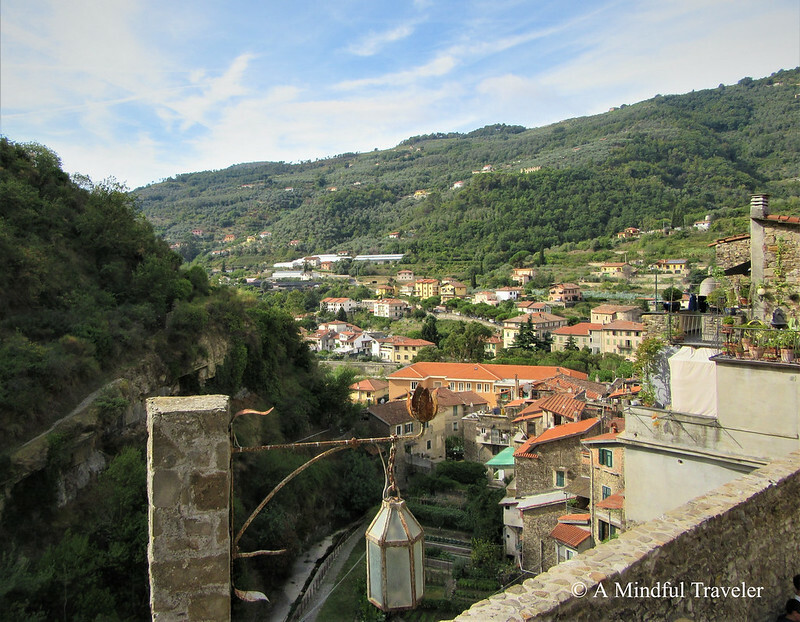 How to get to Dolceacqua? – A10 Motorway – motorway exit in Ventimiglia, before the French border. Pass through Ventimiglia and follow the road signs to Sanremo. 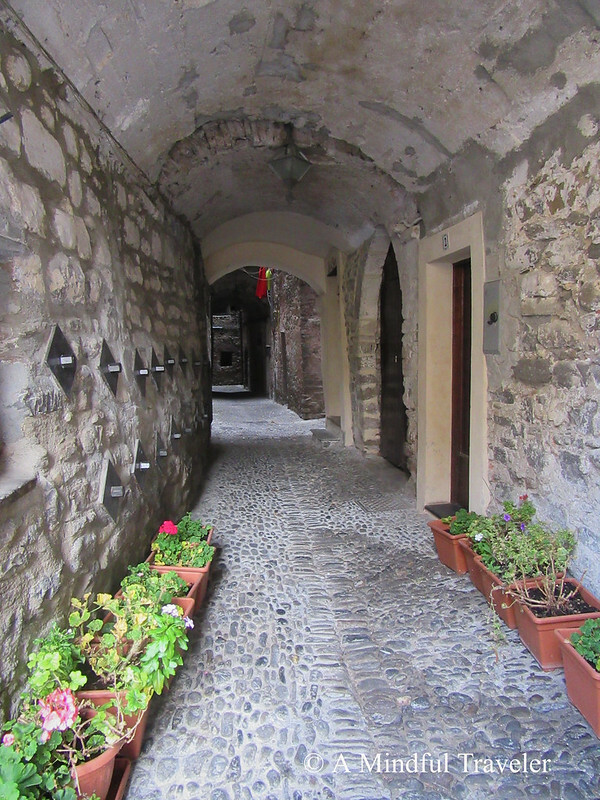 After about 10 minutes you will see the road signs to Dolceacqua. Arrive there in another 10 minutes. –Aurelia SS1 – state road that leads along the Ligurian coast. 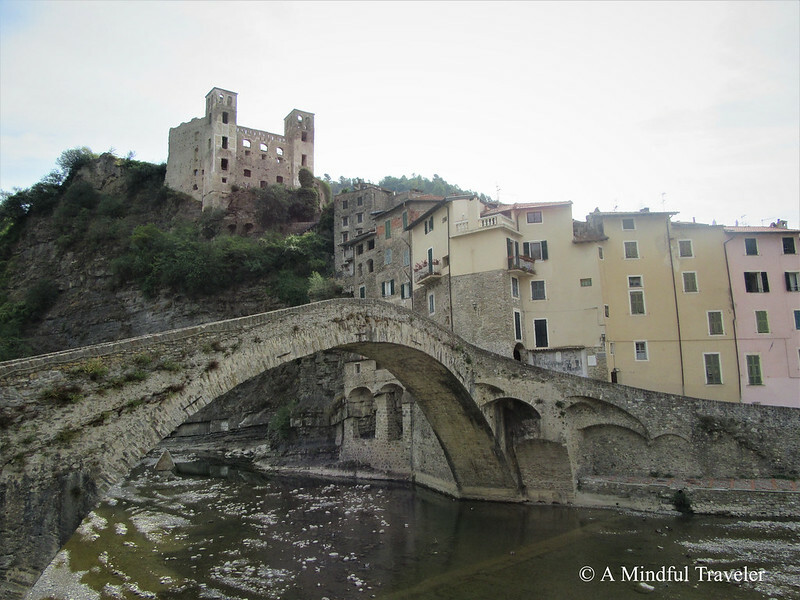 When you arrive in Ventimiglia, turn into road SP64 that leads along River Nervia, directly into Dolceacqua. 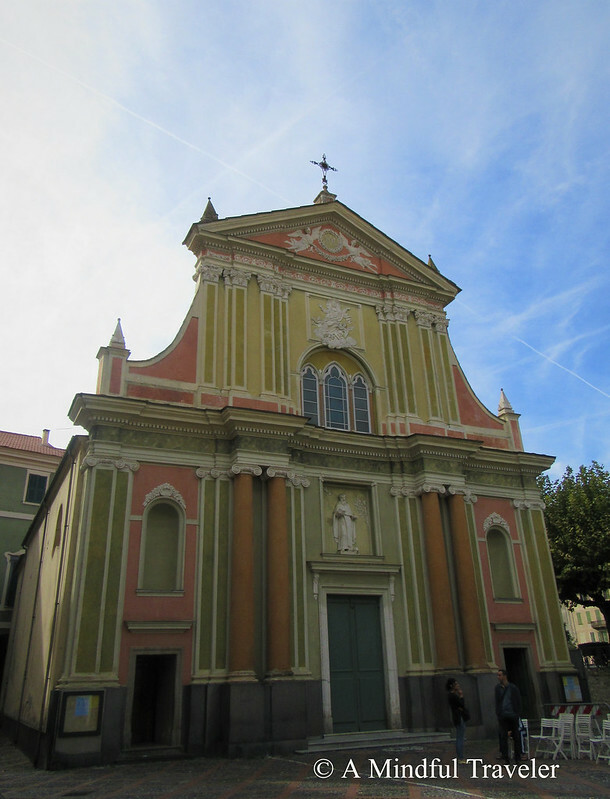 –arrive by train to Ventimiglia and then take the bus line 7. You gave me another place now that I want to visit in Italy. Fell in love with that Country and really want to go back sometime. Thanks for sharing! There are so many places like this lovely. I love the smaller towns and slower travel. So much charm. I just love Liguria! Dolceaqua looks so charming! 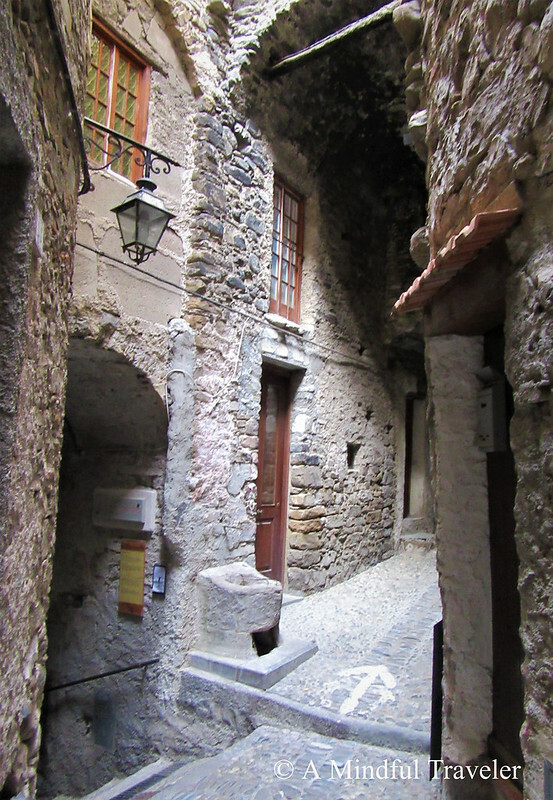 I love medieval towns like this with all of those stone buildings and secret passageways! This place looks exquisite! Thank you for sharing it with us! Great photos! I love the beautiful colors of the architecture. This place seems very calming. What a beautiful town! It looks like a gorgeous part of the world! Such a beautiful place, so pretty. So true Osyth. They are all captivating in their own ways. Gosh what a stunning place! I think I would be in complete heaven here! It’s so beautiful. Every corner is so sweet and pretty! No wonder you chose this! Thank you for joining up again Lorelle! Absolutely gorgeous. I know that I would love that town. Your photos are lovely. I can definitely see a touch of French in the town. Looks like a beautiful little place. Not heard of Dolceaqua before but won’t forget it now. Great photos. What a great pick! 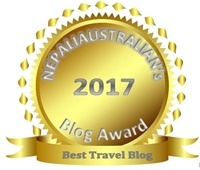 ❤ Thanks for sharing about this amazing hidden gem!! There are so many tiny towns all over Italy that are filled with so much history and character, Dolceaqua looks like a perfect example of this. Thanks for your insight. Wow I love all of those little alleyways! I love the name of this borgo and it looks absolutely beautiful. It’s everything you imagine a borgo to be and more! Who doesn’t love all those little maze-like alleyways, the surprises that wait for you around every corner! Such a wonderful gem – thanks for sharing! What a pretty town. Another one added to my list. Thank you so much for sharing. My list is getting longer and longer.. Such a beautiful town. I especially like the bridge. This looks like such a pretty place to visit. Love your photos. Oh Lorelle, I love this post!! You have such a great way of taking photos to make a place come awake for me. Thank you. 🙂 I’m going to Italy with my spiritual group in October, and I am such in a jazzed place to go! Mostly in the South, though my heart is probably with the North. That’s wonderful news. The south is just beautiful as well. I love each region of Italy as they are so unique and special in their own ways. Will you head down to Sicily? My husbands family is from there and it’s very special to me. You must be very excited for your upcoming trip. Yes. I think these smaller towns are definitely overshadowed by the larger ones, and all I want to do is discover more of them! Oh wow, Portugal. I would love to visit Portugal one day. It seems beautiful. It’s so hard when you live millions of miles away. When we visit Europe we try to make a ling 5-6 week trip to make it worthwhile. Was this your first time there? Such a charming town! My 2019 plan is to see this entire region and then travel all the way to the south of Italy.